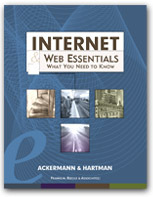 The Web browser is your access point to the information and resources that make up the World Wide Web. When you click on a hyperlink or type a URL in the location field or address box the browser requests information from a Web server. When the information is delivered it is the browsers job to display the information or start another program to deal with it. The commands you use to work with the Web browser are available through the menu bar, the toolbars, the keyboard, and the menus that pop up when you use the right or secondary mouse button. These ways of accessing commands or features stay the same, regardless of what youre viewing or working with on the World Wide Web. The menu bar is a collection of pulldown menus that you can use for almost every operation or command. The toolbar has a number of items, often displayed as text and icons, that give quick access to some of the commands in the menu bar. Several commands are also available as keyboard shortcuts, meaning that you can type them directly on the keyboard instead of using a mouse. Once a page is in the browsers window, you can move around the page using the keyboard, the scroll bars, or the mouse. You can search for words in the page. To go to another page, move the mouse to a hyperlink (the pointer turns into a hand) and click on it. You can also type a URL in the location bar or address box and then press e to access it. The browser keeps track of the sites youve visited during recent sessions. It does this so that you can backtrack and return to sites during a session. The history list holds links to all the sites that you have visited recently. You can collect a set of hyperlinks in the bookmark or favorites list. These will be available from one session to the next. The browser contains commands to let you maintain and manage your bookmark or favorites list. Common sense tells us not to give out personal information, home phone numbers, or home addresses to people we dont know. Were likely not to do that in our daily lives when we dont know the person who is asking for the information, and it is just as important to apply the same rules when were using the Internet or the World Wide Web. The Internet and the World Wide Web give us lots of opportunities for learning, recreation, and communication. We dont need to be rude or unfriendly, but we do need to be careful, safe, and secure. Security and privacy on the World Wide Web are important topics for a variety of reasons, including an individuals desire for privacy, the increased use of the Internet for commercial transactions, and the need to maintain the integrity of information. If you access the Internet by logging into a computer system, you need to take care to choose a password that will be difficult to guess. Furthermore, you should notice and report any unusual circumstances or modifications.